Baptism certificate (Tauf-Schein) for Katharina Zimmermann who was born on April 15, 1923 in Franfurt an der Oder, Germany (a displaced persons camp for many Volga Germans). Katharina was also baptized in Frankurt an der Oder on April 29, 1923. The baptism certificate shown here is a copy made by Rev. Elias Hergert of of St. Paul's church. 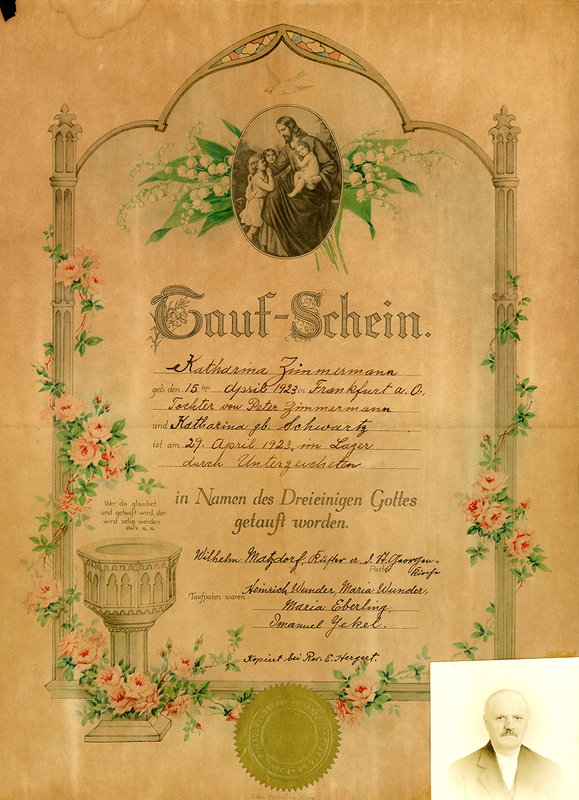 Her parents were Peter Zimmermann (believed to be the person in the photo attached to the certificate) and Katharina Zimmermann (née Schwartz). Courtesy of Jan Mantei. Baptism certificate for Katharina Zimmermann. Courtesy of Jan Mantei. Information and certificate courtesy of Jan Mantei.